Analyst Thierry Bros considers the impact that Nord Stream 2 will have on Europe's gas markets and the implications for EU security of supply and import dependency. During his visit in Brussels, in July, the US president Donald Trump made some harsh comments about Nord Stream 2. As this is a very divisive issue in Europe, let’s try to look at public data and imagine how Europe will be supplied once Nord Stream 2 is on line. The German data is a case of inconsistency: Bafa reported (in German) Russian imports until 2015 but ‘for data protection reasons, imports are no longer reported by country of origin’. So, in 2015, Bafa reported 32%, while using Gazprom Export data we achieved then 53%! 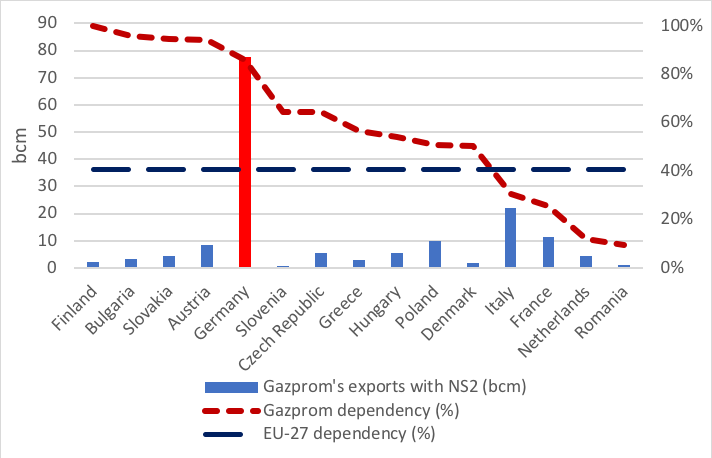 Since then, Nord Stream 1 has been operating at much higher load factor while Dutch Groningen has been severely cut leading to Gazprom exporting an additional 8bn m³/yr, hence German dependency on Russian gas increasing to 55% using our methodology. Gazprom agrees to keep 50bn m³/yr volumes transiting via Ukraine (compared with 77bn m³ in 2017) to please the EU Commission which might otherwise have the power to stop flows in Nord Stream 2 (as it did in capping the flows in the early part of Nord Stream 1). Rerouting 27bn m³/yr away from Ukraine for its Austrian, Dutch, French and German partners. Under this fictional 2021 scenario, Nord Stream 2 transports 55bn m³/yr and Gazprom exports increases between 2017 and 2021 by 28bn m³/yr, in line with Gazprom available spare production capacity (83bn m³ in 2017) and reroutes 27bn m³/yr away from Ukraine. We also assume demand stays the same in each EU country. All other countries get the same amount of gas with Austria, France and Netherlands being supplied more by Nord Stream 2 instead of via Ukraine. We then end up with a EU-27 dependency of 41%. This starts to be a high stake and could be detrimental for a competitive market level playing field but the major issue is about the EU solidarity mechanism. An EU insurance policy can only work if every country follows the rules. For example, the Italians, the Greeks, the Spanish, the French are forced to pursue unpopular budgetary tightening measures to meet the Maastricht targets even if they would much better enjoy spending the hard-earned German euros! have the capacity to meet yearly demand without their largest upstream supplier. 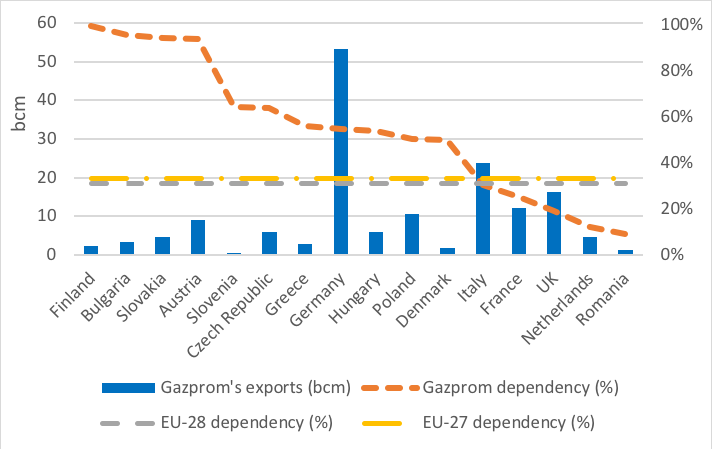 So, if Germany (the biggest EU-27 gas market), that already doesn’t fully follow those rules, becomes 86% dependent on a single supplier (with an HHI then above 7,400), would it be fair for others EU citizens to reduce their gas consumption if an unexpected event was impacting Nord Stream to allow the vulnerable Germans not to freeze in the depths of winter? If Germany does not follow the EU rules ahead, it should not be able to ask its neighbouring member states for help in case of a major problem. The Russian government has during the EU-Russia-Ukraine Berlin talks on 17 July 2018 already acknowledged the need to continue to use Ukrainian grid for transiting gas to the EU. We believe a 50bn m³/y could be something acceptable by both Russia and the EU. As we didn’t assume any demand growth during this period, in this scenario, Gazprom pipe replaces fully the Groningen cut (-12bn m³/yr), the Algerian pipe exports drop (-6bn m³/yr as domestic demand grows and supply stays the same) and displaces some other pipe and LNG (-10 bn m³/yr) which is consistent with a tight LNG market. HHI is a commonly accepted measure of market concentration and is calculated by squaring the market share of each firm competing in the market and then summing the resulting numbers.